Came across this very fun wedding feature on Green Wedding Shoes website, and wow !! In light of Cinco De Mayo coming up, I felt the need to share with everyone the details of this festive wedding. The men outdid themselves; I mean, REALLY outdid themselves. With the green Charro Suits, how can anyone NOT SMILE at this wedding? I think what everyone is wondering is how in the hell did his fiance give into this idea?! Oh, that’s right, she didn’t know. Apparently, the bride grew up traveling back and forth to Mexico, it’s where she and the groom took their first trip, and it is also where the groom proposed to her. 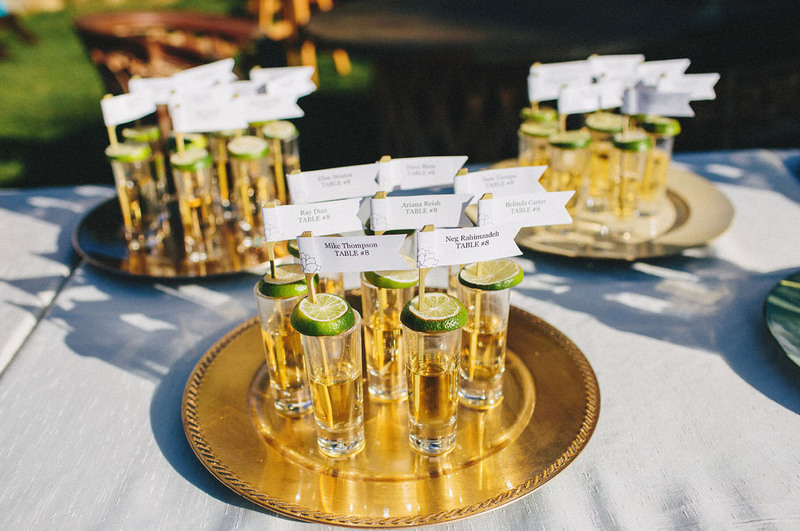 Everything in Mexico felt EASIER to them, and that is what they wanted to reflect for their wedding; ease and fun. To answer the question of how the bride allowed for these Charros to happen; the article states the bride said there was “no dress code and no rules” - first mistake - which leads us to the culprit. The groom's best friend was given the reins for choosing the groom’s outfit for his big day - second mistake - and he's known as "Costume Craig". Safe to say the BFF is the perp behind all of this greenery. The outfits were embroidered and custom made straight from Guadalajara, Mexico; however, the vests were missing so the BFF and groom had to hunt them down. Needless to say, the groom and groomsmen's outfits probably required more energy and time than the brides dress and bridesmaids apparel. Moving right along, the party didn't stop at the avocado suits, there were also tequila shots, cigars and one big pig. Yes, a pig… for pig-pickin’, duh! The couple roasted an entire pig as part of their wedding day feast. Their wedding was held in Baja California at a venue called Hacienda Guadalupe; absolutely gorgeous BTW. The wedding clearly ended up being a happy, energetic, exciting and festive affair; so who could ever be mad, even at those suits? And the bride and groom still love each other even after she discovered she was marrying Bruce Banner; so that’s good. I think the lesson here is to DO YOUR WEDDING YOUR WAY - who cares what anyone else thinks. It’s your day, have fun, dress how you want to dress. She’s a champ for getting through their wedding day with those Gumby suits because I don’t think I could look at them all night. Could you give your guy the green light on choosing his own grooms outfit?